Creating a Custom Caster for Feat of Service! | Miniature armies, huge time sink. Man, where to start? Well lets go down the line. When Hawk first began to flesh out the idea for the event, initially I went for a caster that would work in Menoth. 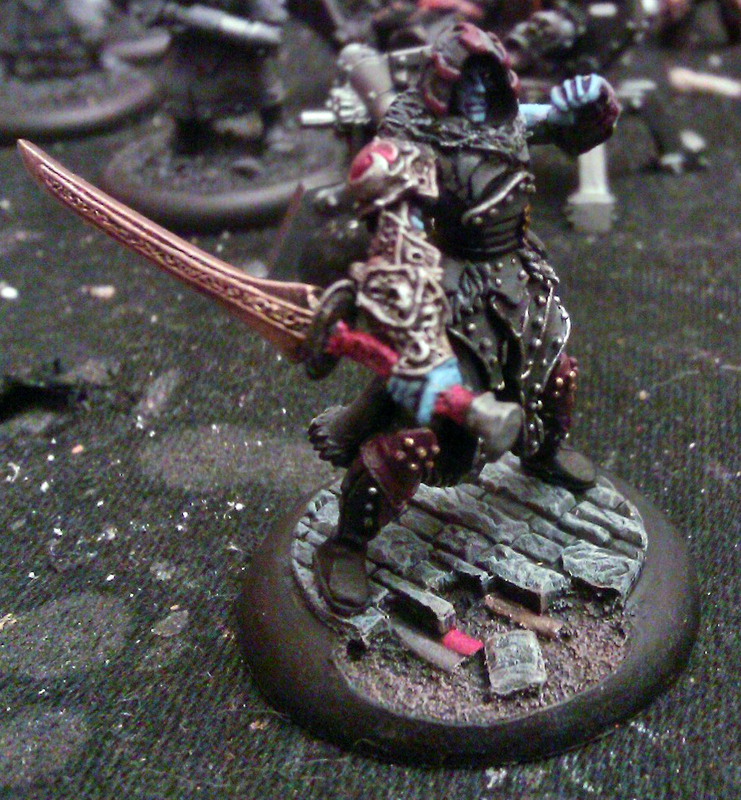 But then I remembered I already have a perfect custom model that could EASILY be used as a warcaster/warlock! Rohan Larisar, First of his Name, Last of the Frozen Blade Shard, the Demon in the Mists. Boom. Now which faction should he lead? Well, Legion is a natural fit (shocking I know). Alright, that’s two points down. Now what is the “chassis” that he’ll be built off of? Basically the chassis are all the Prime/Primal casters. You choose one to based your caster on, and you retain all their stats, weapons, special rules, WJ/WB points, feat, etc. But you wipe the spell card. I wanted a chassis that was versatile. Sure Kreoss1 is great for the feat, and Butcher1 is great for feat and well, just general stats-wise I guess. But I figured that was was going to be the number 1 and 2 chassis selected by participants. I knew I wanted a few things, like 7 focus at least, in order to be able to make the most of any spell draft picks. My first pick was Vlad1. He had all the right stats and his feat is crazy in Legion. Charging Angels 17″ across the table sounded like fun, but ultimately one-trick and probably not as practical in practice on the table. Ultimately I decided on Hexeris. His statline is just about the same, but his weapon was a bit better in my opinion and more in line with the take-no-prisoners battle wizard I was building towards (reach and beat back into enemy lines). His feat was also very interesting and I envisioned it as an almost perfect mirror of the moniker I had come up with for Rohan. Next was to build a 25pt list. This was also easy as the models I have for my Rearguard mesh very well with the theme I’m going with. The Swordsmen and Nephilim Solider were pretty much a given. And It’d give me a chance to use the Blackfrost Shard I’ve had languishing in the bottom of my model bin for years now. I was going with a theme, in our IKRPG game, the Frozen Blade Shard were essentially warrior monks focusing on the mastery of the Nyss claymore and ice magic. That leaves 10 points as per the rules. These 10 points you fill out after you’ve done the spell draft. It gives you a little leeway for things like if you don’t get as many battlegroup spells as you were hoping for or something. SPOILER ALERT: I’m thinking it’s going to be a Ravagore no matter what. One: because I need some range, two: because it’s an even 10 points, and three: because I feel like I’ll need another heavy to fuel my warlockfury-wise. There you have what I have going into the spell draft. And this seems like a perfect place to stop. What do I pull in the spell draft? We’ll find out next post!! SUSPENSE! Pingback: Creating a Custom Caster for Feat of Service: Spell Draft Time | Miniature armies, huge time sink.